The first required course on our calendar was the marine first aid course which took us four evenings to complete. The course dealt with the various illnesses and injuries common to the marine environment as well as what to do when a doctor is not immediately available. The last evening of the course was hands-on with practice in making splints and bandages, giving injections, treating burns, removing foreign objects from someone’s eye (almost made me faint!) and well as CPR, using a defibrillator and mouth-to-mouth resuscitation. In January of 2012, we began the off-shore theory course, which ran one evening a week, plus a few Saturday mornings for about 5 months. We had the same “syllabus” as the RYA yacht master theory, with the exception of astronomic navigation. The use of the sextant is not required for our license. The area we use is all of the chart work and tidal height and stream calculations is the area comprising the Channel Islands, west of the Cotentin Peninsula in France, and north of St. Malo and the eastern Brittany coast — so we do work with tidal heights and currents. 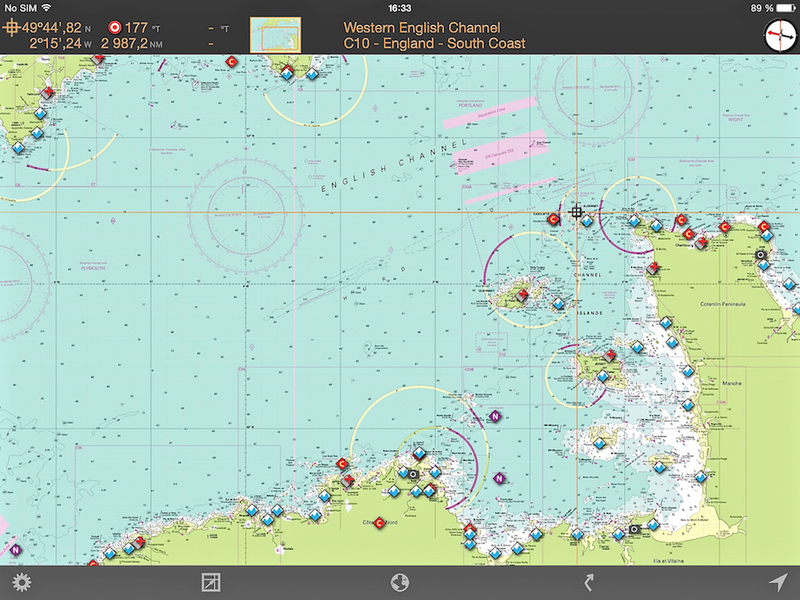 This is the area in the English Channel we used for most of the chart work and passage planning. We have these charts from Imray on our iPads. Irmay also has the Rules and Signals app, which has a full set of the COLREGS – highly recommended! In addition to the course we did with the Swiss Cruising Club, we followed a video course in navigation done by Duncan Wells at Westview Sailing. He provides navigation instruction in an easy-going and humorous way, and the videos are really well-done. We think he must have had some television experience as he’s well-spoken and the videos have excellent sound quality. Duncan’s video course was immensely helpful to us because you can repeat the instruction and exercise as much as you want. 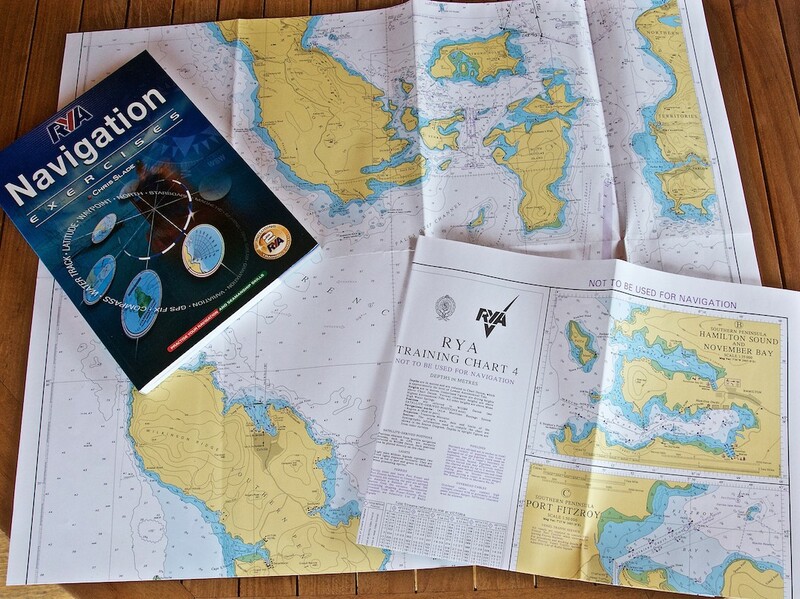 Sometimes explanations don’t sink in the first time… All you need is the RYA instruction chart (a fictional chart) that come with the RYA Navigation Exercises book. We found this on Amazon. Weather is, of course, an important part of seamanship, and we had some great instruction from a former Swissair pilot, on how to read synoptic charts, how pressure systems and fronts work, recognising clouds and cloud formations and what they tell you, etc. A site that we found useful for learning even more about the weather is Frank Singleton’s Weather and Sailing Pages. We also downloaded the Steve and Linda Dashew’s e-book Mariner’s Weather Handbook. You can download this “Weather Bible” as well as another book called Survive the Storm from their website Setsail. After absorbing the instruction and sweating through the all of the exercises throughout the spring, we sat the 7-hour long exam in mid-June. The morning part, from 8.30 to 12.00, consisted of questions on seamanship, weather, COLREGS, security and first aid. In addition, we had four tidal height exercises (will we have enough water at this anchorage at low tide, will we be able to enter the marina at St. Helier or St. Malo, what is the latest time we have to exit the marina, etc.). We had a lunch break, until 13.30, and then we were given the most difficult part of the exam – 20 chart and passage-making exercises to complete before 17.00. After we handed our chart work, It took another hour for the group of “judges” to go over our exams and give us either a pass or fail. We then had to wait until the names of the people who passed were called. My name was called second but poor Jacques was the last one called! He had to suffer in suspense until the end. We had gotten through the theory part of the license requirements. 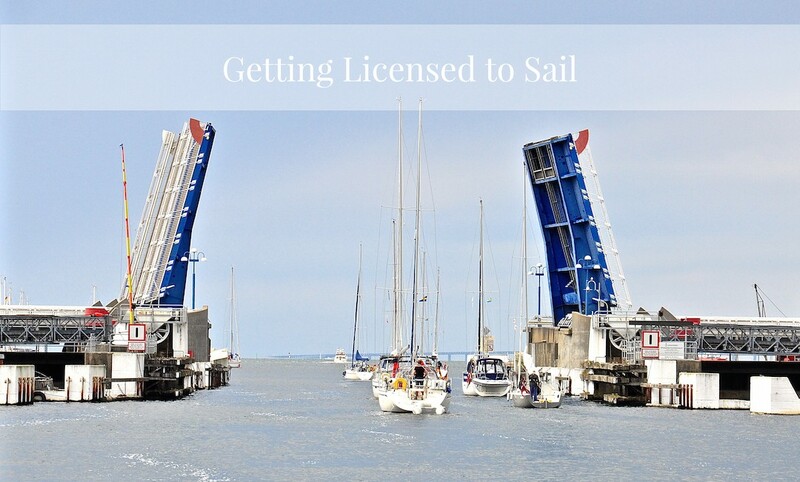 Now we just had to get 700 more certified nautical miles under our belts!